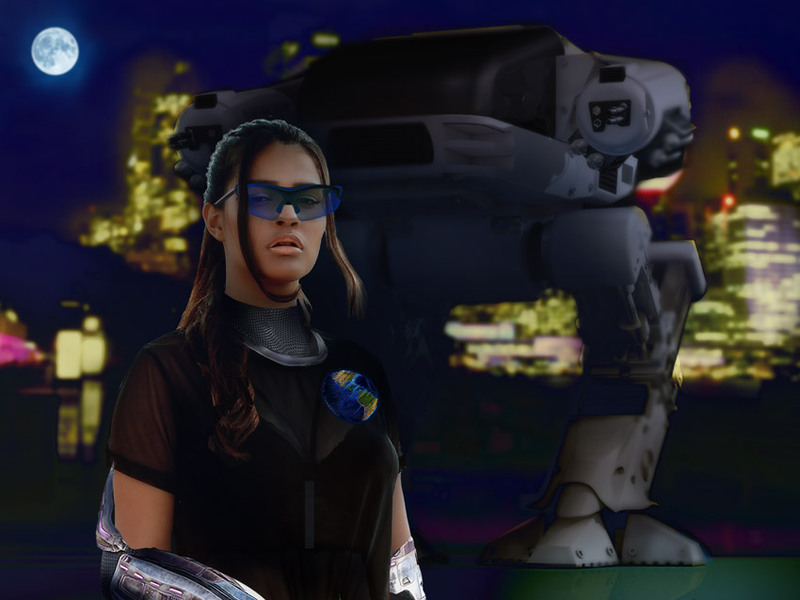 Test out your skills and build a sci-fi scene from scratch! In this tutorial, I’ll show you how to make a cool 80s-inspired photo manipulation using free stocks and 3D assets in Adobe Photoshop. Get inspired! Find more stocks for your manipulations on Envato Market. 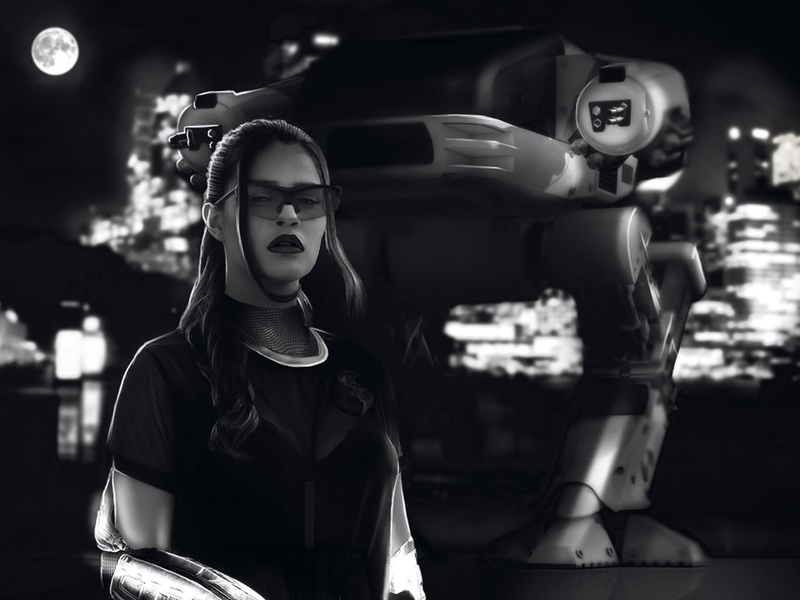 I’ve been wanting to make a sci-fi manipulation for a while now. 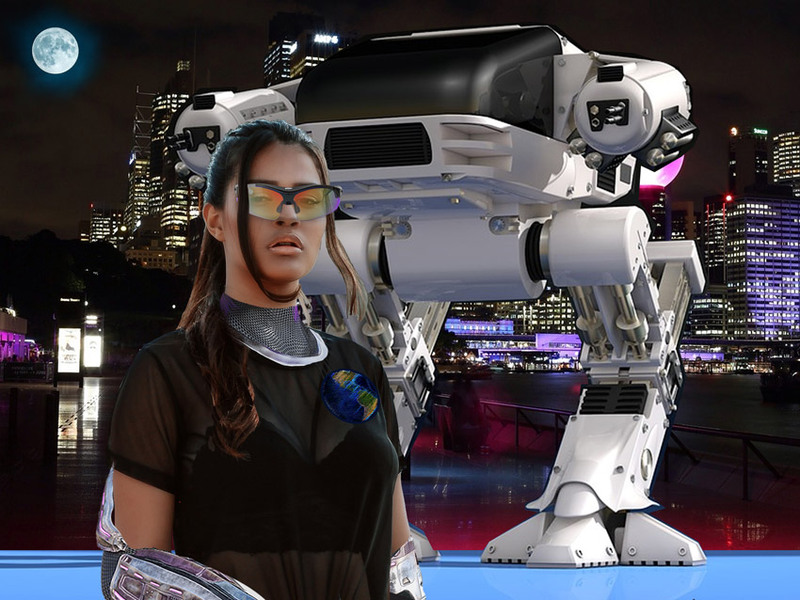 So I was super happy when I stumbled across this Robot stock, modeled after the ED-209 machine in the movie, RoboCop. 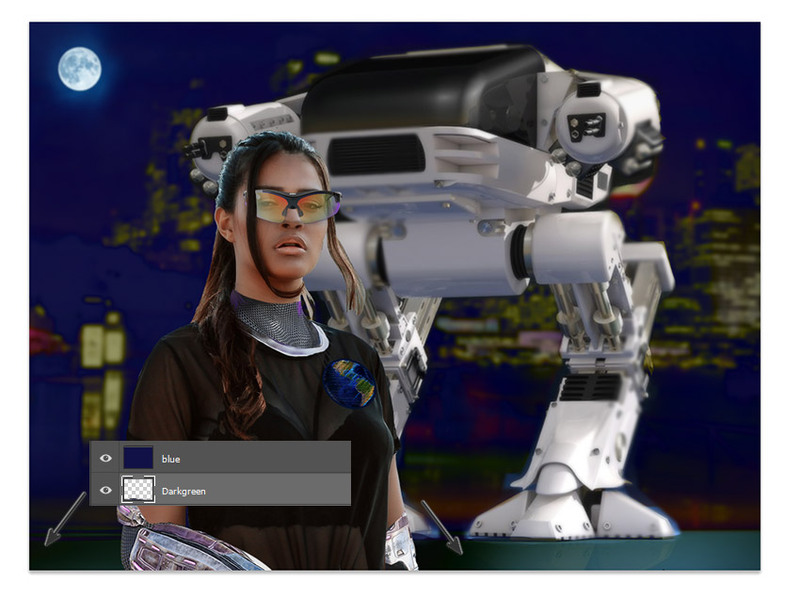 So with this in mind, I’ll be going for a total 80s sci-fi look, complete with body armor, an 80s droid, and a night-time city scene. 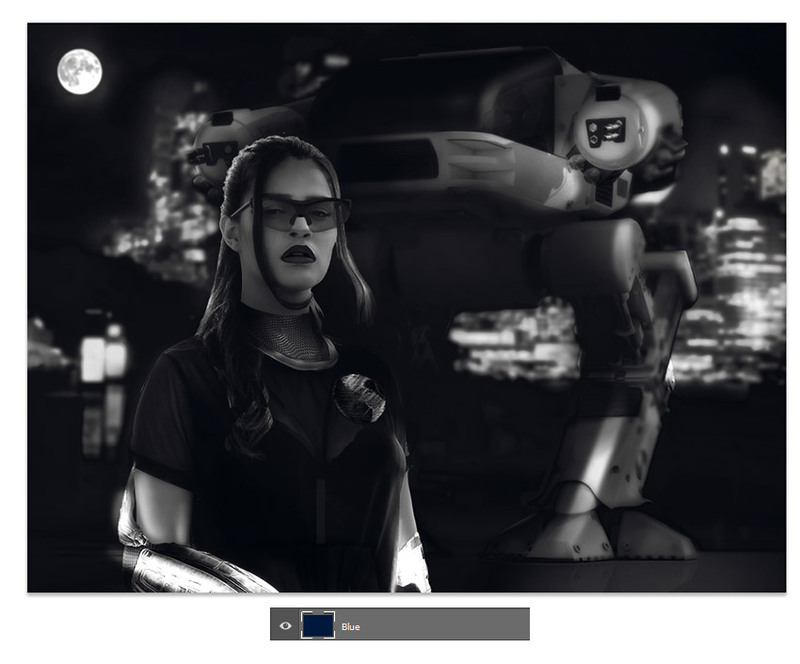 Though it’s not based on the movie, this photo art can still be made by finding inspiration about the series online. Just check out the background characters and story for more ideas. Pretty cool! We’ll learn how to build the entire scene from scratch, using a couple of free stocks and 3D assets from Envato Elements. Start by creating the general composition. Open a New Document in Photoshop at 2000 x 1500 pixels and 300 dpi. Copy and Paste the Robot Stock onto a New Layer. Resize it with the Free Transform Tool (Control-T) and position it to hug the right side, as shown below. Feel free to delete the original white background layer. In order to make the most out of this image, we need to cut it up. We’re still going to use the dark gradient background and flat ground, so we just have to separate the robot onto a New Layer. 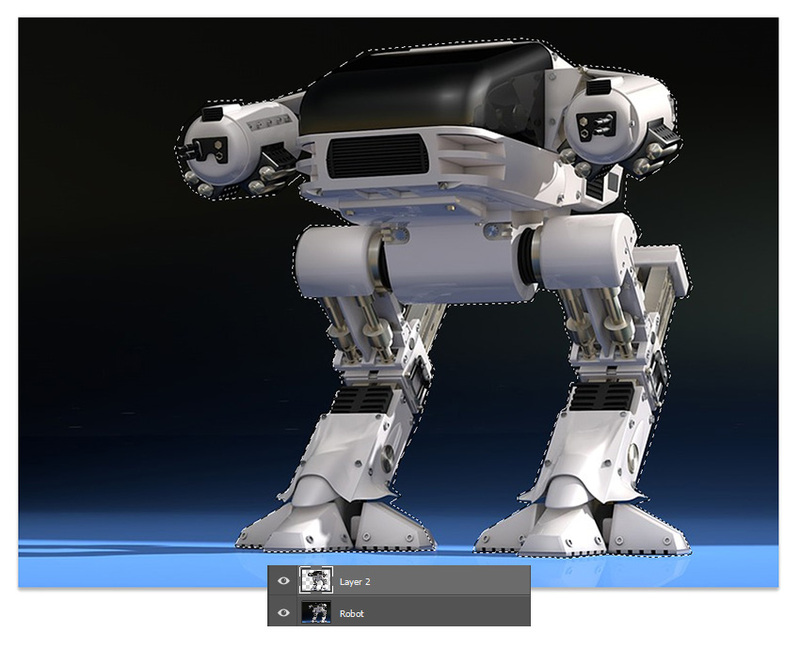 Use the Polygonal Lasso Tool (L) to make a selection around the robot. It’s okay if the selection is imperfect. Once it’s selected, hold Control-J once to create a new Duplicate onto a New Layer. 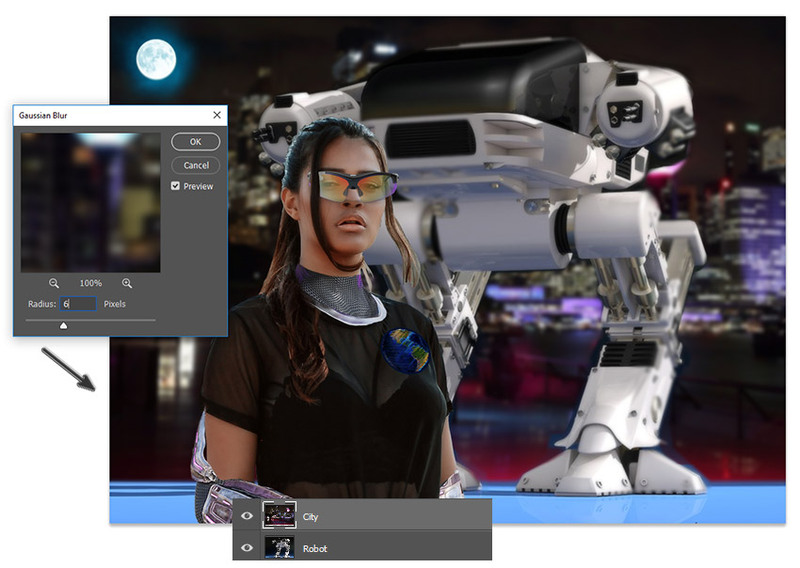 Copy and Paste the City Stock onto a New Layer above the original Robot layer. Free Transform (Control-T) to resize the city picture and fill up the background. But make sure the bottom floor from the robot stock is still visible! Let’s add the model next! 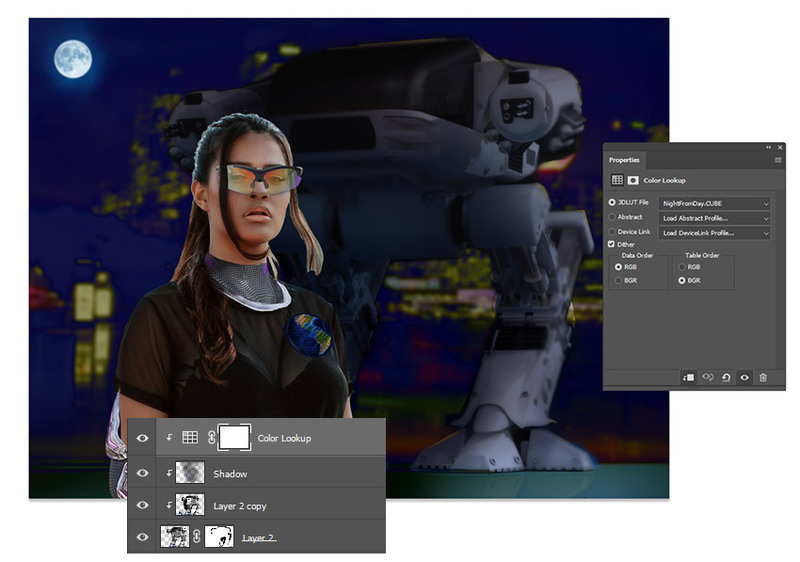 Copy and Paste the Model Stock onto a New Layer above the robot copy (Layer 2). Resize the picture (Control-T) to fill the document as shown. Then add a Layer Mask to the model and use a Hard Round Brush (100% Hardness, 100% Opacity) to paint black onto the mask until the entire background is removed. For more style, let’s add the glasses and armor. 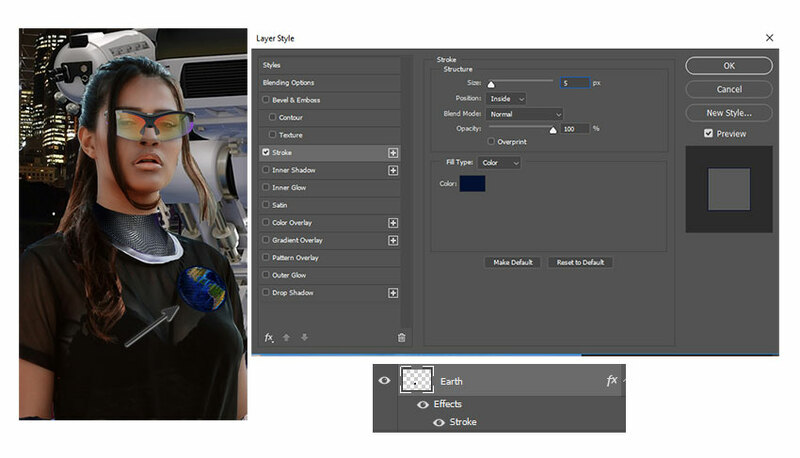 Copy and Paste the glasses onto a New Layer above the Model layer. 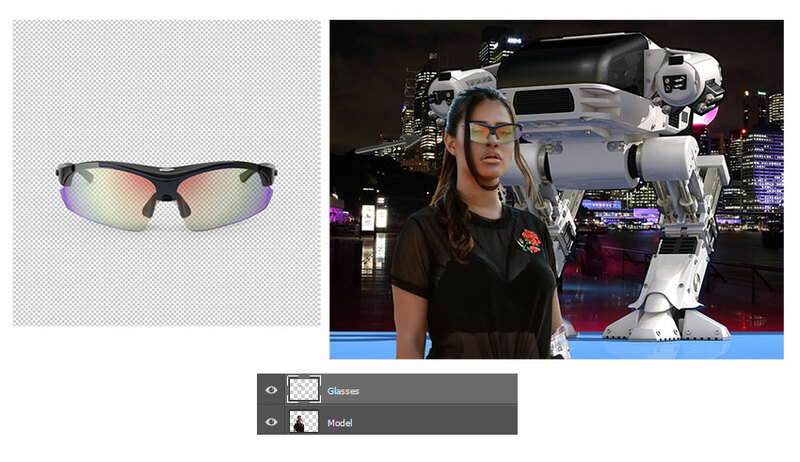 Resize (Control-T) the glasses so that they fit the model’s face better. 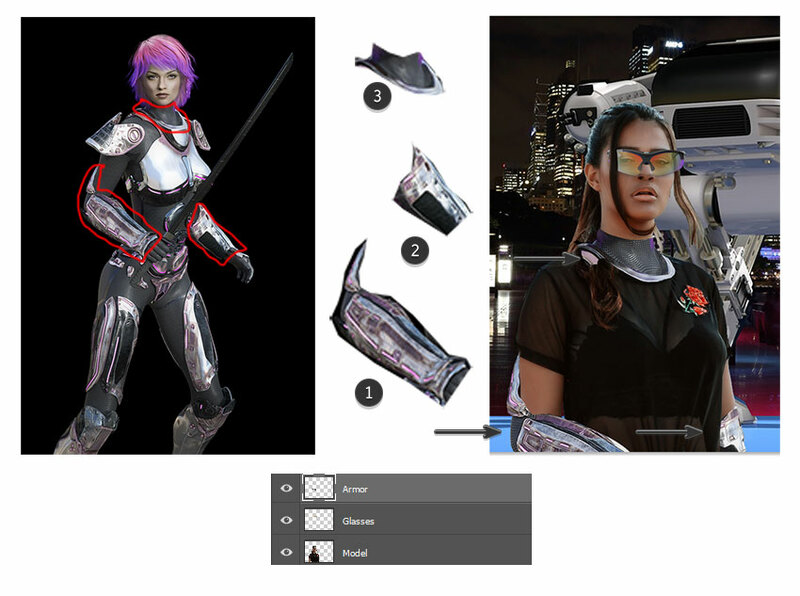 Use the Polygonal Lasso Tool (L) to select these highlighted areas one at a time from the Armor Stock. Copy and Paste each piece onto a New Layer and position them to fit onto the model. Use the Eraser Tool (E) to erase any areas you don’t want showing. Once they’re positioned, Merge all the armor layers together. For a little extra length in her hair, add some extensions to the ponytail! Simply select the ponytail with the Polygonal Lasso Tool (L). Copy and Paste it onto a New Layer, and then use the Free Transform Tool (Control-T) to make the hair longer. Erase any areas you don’t need before Merging the layer with the original Model layer. The next thing we’ll add is the Earth patch. We’re going to apply this to her outfit to add to the visual story. Creating a quick embroidered patch will help cover the red flower shown on the model’s chest, which is currently a little distracting. Open the Earth Stock in Photoshop. Then go to Filter > Filter Gallery. When you’re finished, Copy and Paste the Earth patch onto a New Layer above the model. 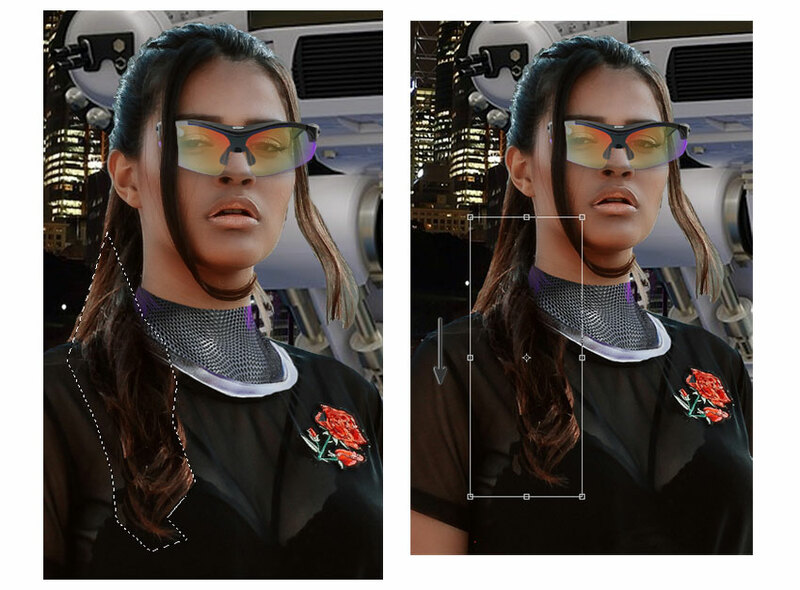 Use the Free Transform Tool (Control-T) to change the perspective so that it’s resting on her chest. Then Right-click the patch layer and go to Blending Options. Add a quick blue #031030 Stroke with the options shown above. The last piece of this puzzle is the moon. Copy and Paste a selection of the Moon Stock onto a New Layer above the others. 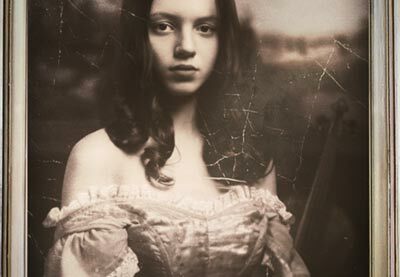 Add a Layer Mask to the layer and use a Soft Round Brush (0% Hardness, 100% Opacity) to mask away the harsh edges of the picture. Here is the composition so far. Now that we have all the elements in place, we can move on to creating depth of field. Depth of field will give us that realistic look by making sure that the objects look more blurred as they move farther away in the distance. Select the robot copy (Layer 2) and hold Control-J to create another Duplicate. Temporarily hide the copy, and then go to Filter > Blur > Gaussian Blur. Add a Radius of 5 pixels and hit OK. This second copy of the robot will help bring some of the details back. 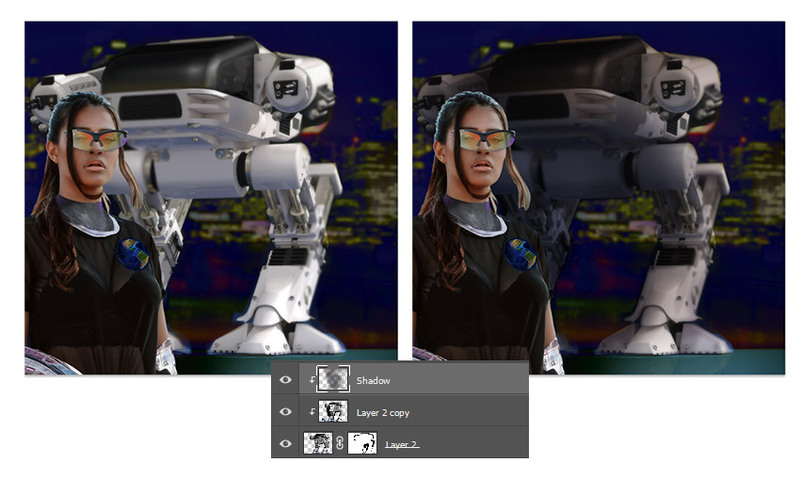 Unhide the robot copy (Layer 2 copy) and Right-click to set it as a Clipping Mask to Layer 2. Now lower the Opacity to 50%. Now that the robot shows much clearer, Erase any areas you prefer to stay blurred with the Eraser Tool (E). You can also take this time to refine the original robot. Add a Layer Mask to mask away any remaining parts that are showing above the city. Move on to the City layer. Select the layer and go to Filter > Blur > Gaussian Blur. Add a Radius of 6 pixels and hit OK.
Lastly, we’ll blur the moon. 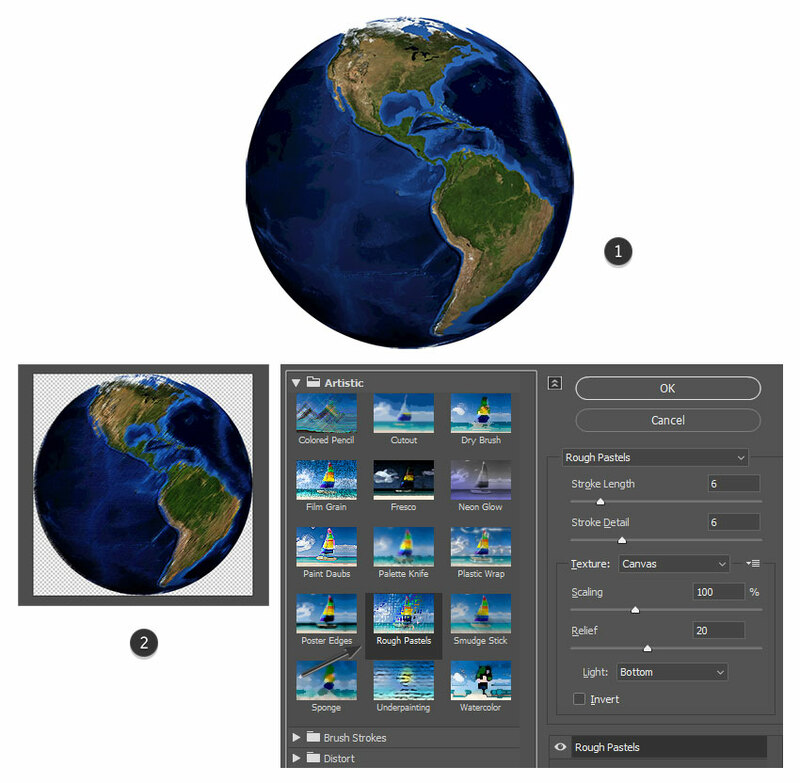 Select the layer and change the Layer Blend Mode to Screen. Then go to Filter > Blur > Gaussian Blur. Add a Radius of 4 pixels and hit OK.
To make this scene more realistic, we’ll need to adjust the lighting extensively for a beautiful night scene. Try not to get too distracted by the color changes; we’re just focusing on the shading values for now. 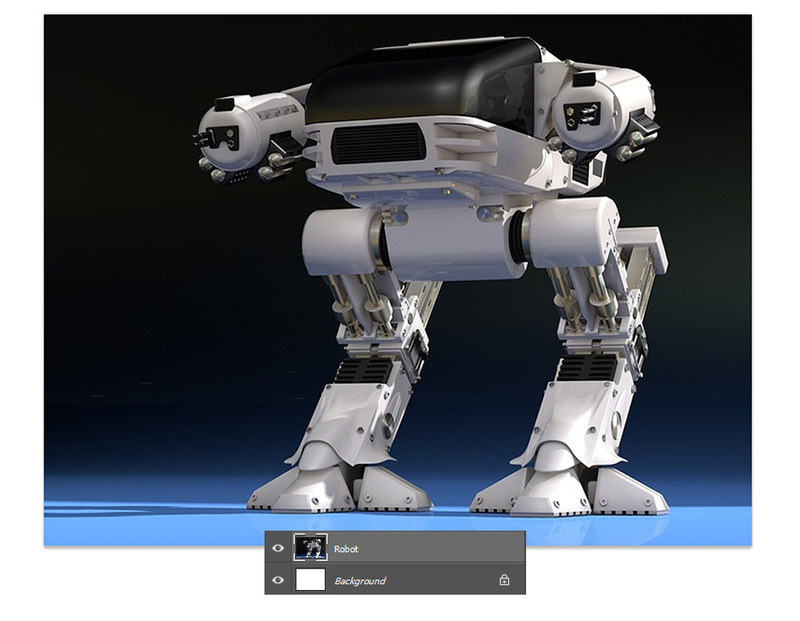 Create a New Layer below the robot copy (Layer 2) and fill it with blue #111146 using the Paint Bucket Tool (G). Set the Layer Blend Mode to Difference. Create another New Layer, this time below the blue layer. Use a Soft Round Brush (0% Hardness, 70-80% Opacity) to paint greenish-black #020811 along the bottom of the ground. Allow a single bit of light to appear below the robot’s right foot. Set the Layer Blend Mode to Multiply. 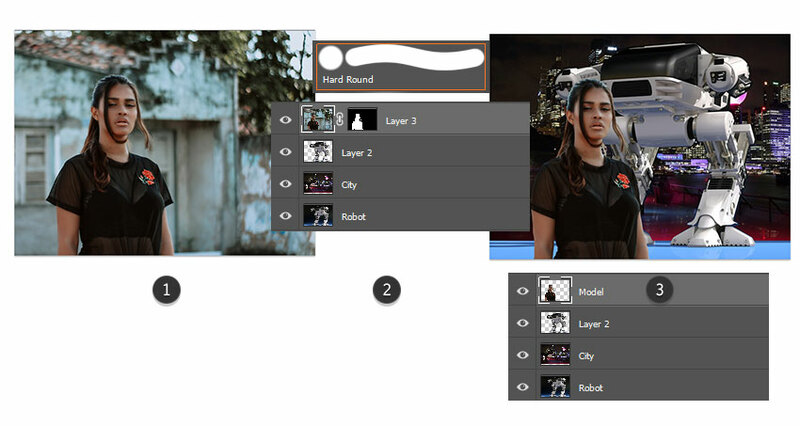 Create another New Layer, set as a Clipping Mask to the robot copy (Layer 2). 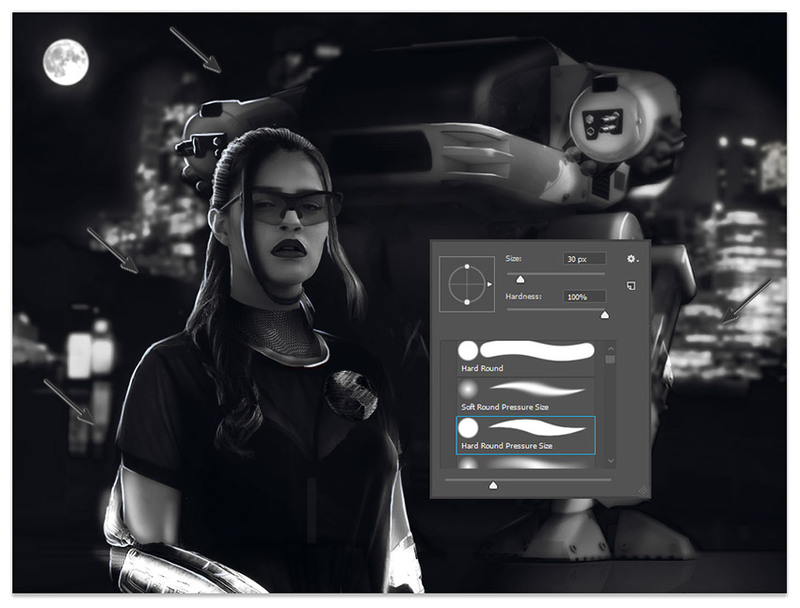 Set the Layer Blend Mode to Multiply and use a Soft Round Brush to paint dark blue #151b31 all over the left side of the robot and brown #38150c towards the top. Make sure to get into those crevices too! 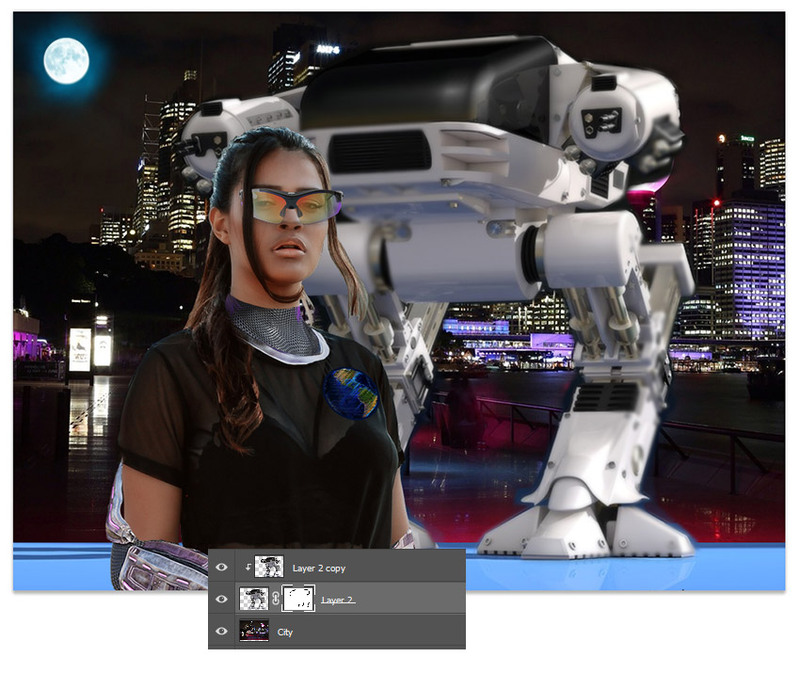 Our light source is coming from the right, so make sure the robot is mostly shaded behind the model. 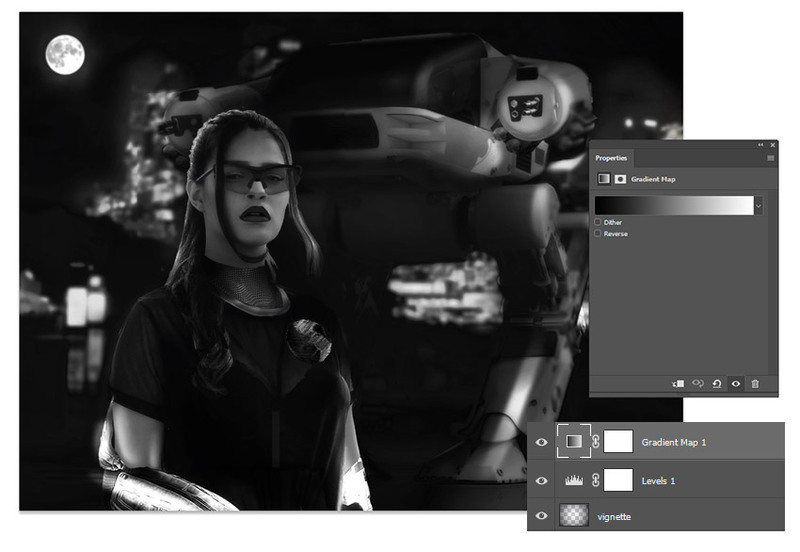 To make the robot even darker, add an Adjustment Layer. 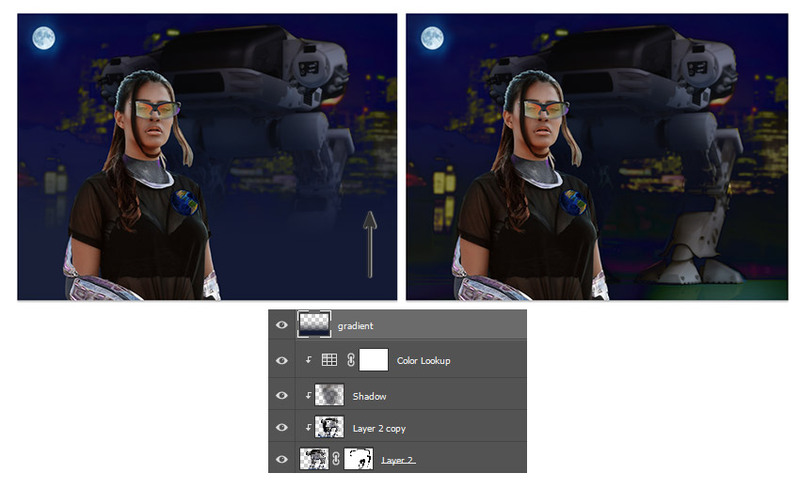 Set a New Color Lookup Adjustment Layer as a Clipping Mask to the robot copy (Layer 2). 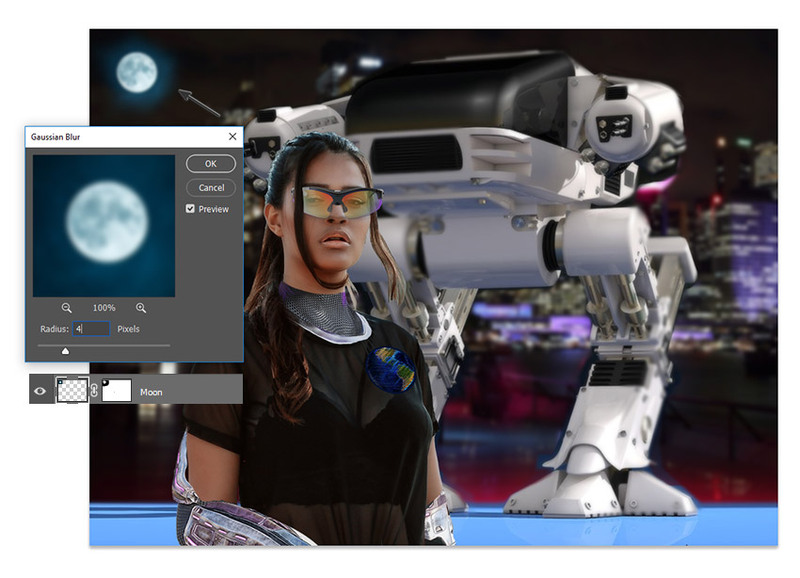 Set the 3D LUT File to NightFromDay.Cube. Then set the Layer Blend Mode to Darken and the Opacity to 65%. Let’s continue to darken the background. 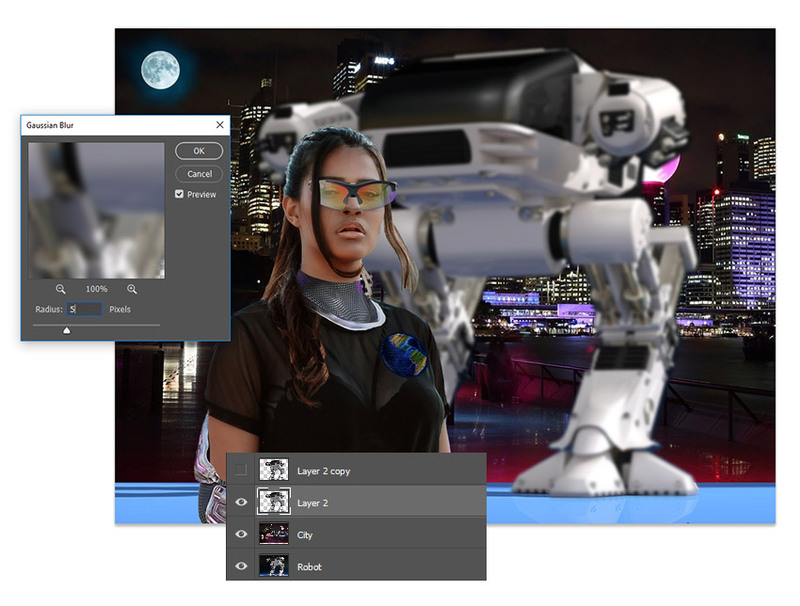 Create a New Layer above the robot copy. This one shouldn’t be clipped. Use the Gradient Tool (G) to create a blue #131a33 to transparent Linear Gradient moving upwards from the ground. Set the Layer Blend Mode to Difference and the Opacity to 78%. Create a New Layer underneath the Dark Green and Blue layers. Use a Soft Round Brush (0% Hardness, 70% Opacity) to paint yellow #e0e0ad onto the city lights. Set the Layer Blend Mode to Overlay and the Opacity to 61%. Now let’s shade the model. Create a New Layer and set it as a Clipping Mask to the model. 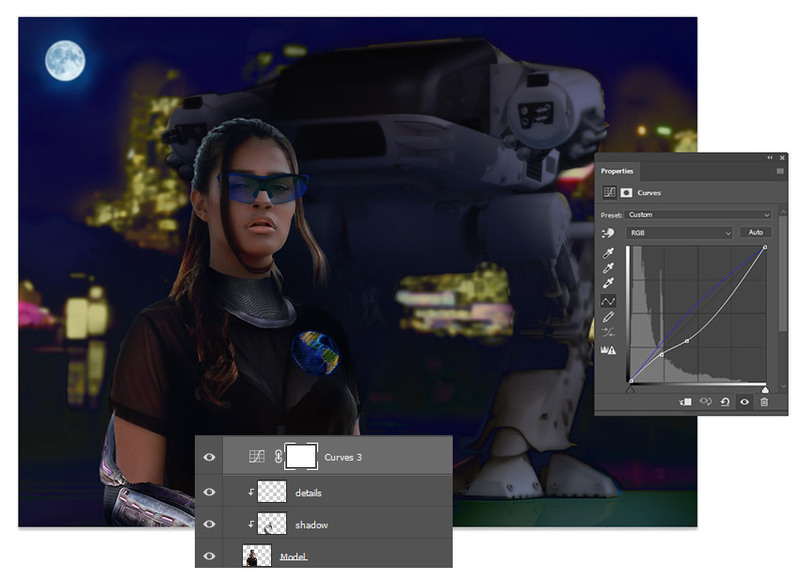 Set the Layer Blend Mode to Multiply and use a dark blue #0e1328 to paint soft shadow onto the model with a Soft Round Brush. We’ll need to color/darken the glasses separately. 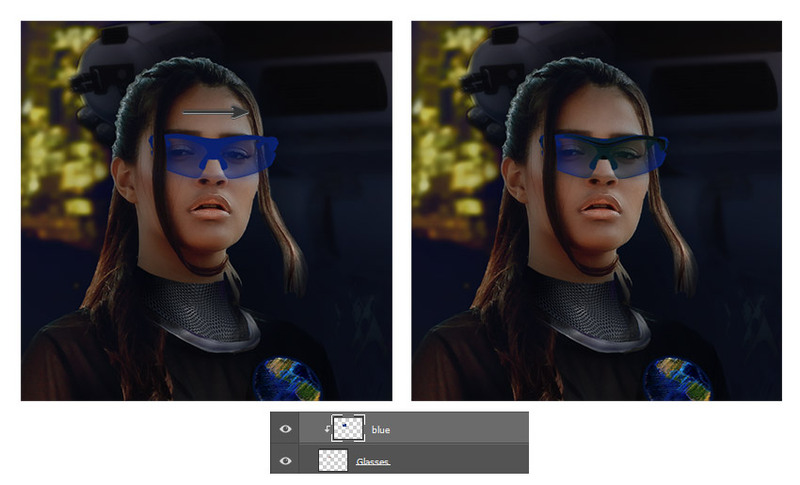 Create a New Layer above the Glasses layer and set it as a Clipping Mask to the glasses. 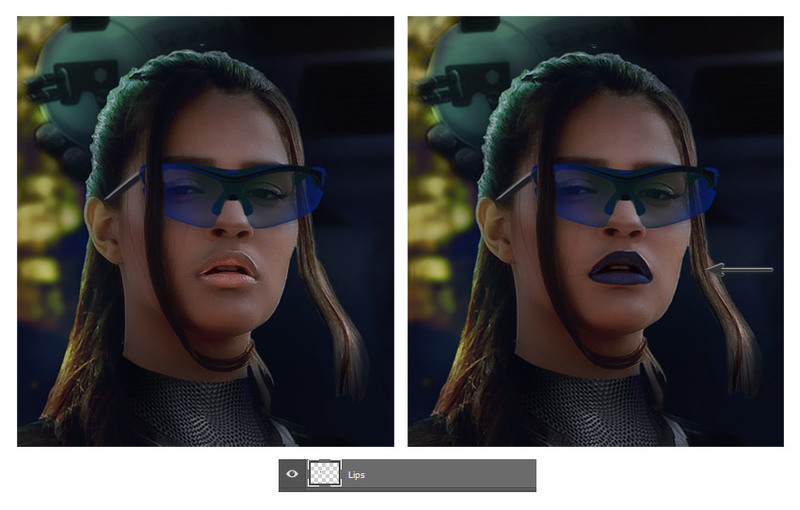 Use a Hard Round Brush to paint blue #0a206c all over the glasses, and then set the Layer Blend Mode to Darken. Take this moment to clean up any areas or add extra details with a Hard Round Brush. 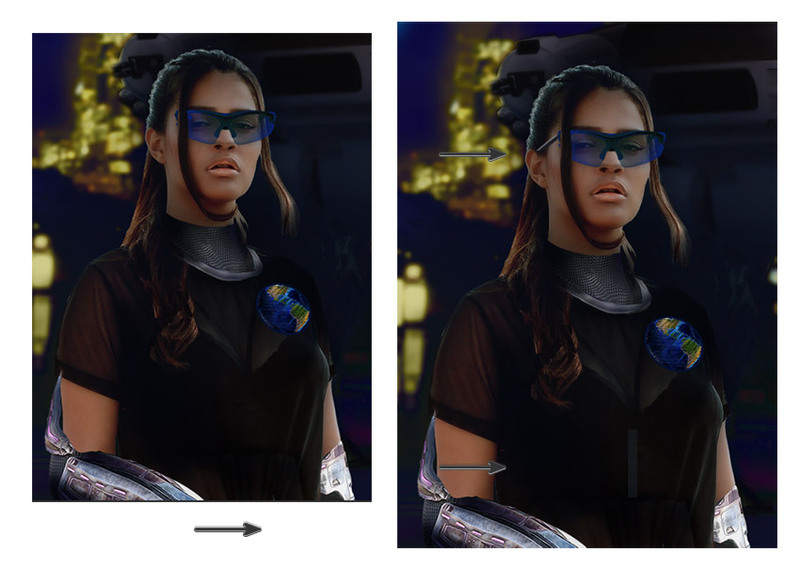 Here I added an earpiece (with highlights) for the glasses, a rectangular bar on her shirt, and painted away the original earpiece that covers her eye. Just use the Eyedropper Tool (I) to sample colors from these areas to add these details on a New Layer. Here is what the composition currently looks like. For the final stages of this manipulation, all we need to do is add a little more lighting and tweak the final colors with Adjustment Layers. Temporarily Hide the detail layers. Create a New Adjustment Layer of Curves above the Model layer. Set the curves like the ones shown below for the RGB and Blue Channels. This will make the whole scene a little darker. Now light up the armor and robot! Create a New Layer above the rest. Use a pale green #b6d6be to paint light on the armor and robot with a Soft Round Brush (0% Hardness, 50% Opacity). Then set the Layer Blend Mode to Vivid Light. Make sure that some of the light is reflected onto the model’s skin, hair, and outfit. For more style, add a dramatic lip color. Unhide the detail layers. Create a New Layer set to Multiply. Paint blue #283d89 onto the model’s lips for an intense, stylish look! Continue to tweak the lighting. Add a quick vignette! Create a New Layer set to Soft Light. Use the Gradient Tool (G) to create a blue #010228 to transparent Radial Gradient, making sure the Reverse option is checked. Lower the Layer Opacity to 50%. Now let’s make this composition black and white! Because the colors in each stock are so different, this ends up being a much better option than leaving it in color. But feel free to experiment! 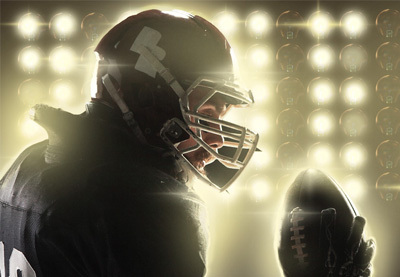 Create a New Adjustment Layer of Gradient Map above the rest. Add a black to white Linear Gradient, and then set the Layer Blend Mode to Color. For a slightly blue hue, fill a New Layer with blue #00183b above the rest, using the Paint Bucket Tool (G). Then set the Layer Blend Mode to Lighten and the Opacity to 15%. For this last step, all we need to do is use a tapered Hard Round Brush to paint crisp white highlights around the scene. Do this on one last New Layer. 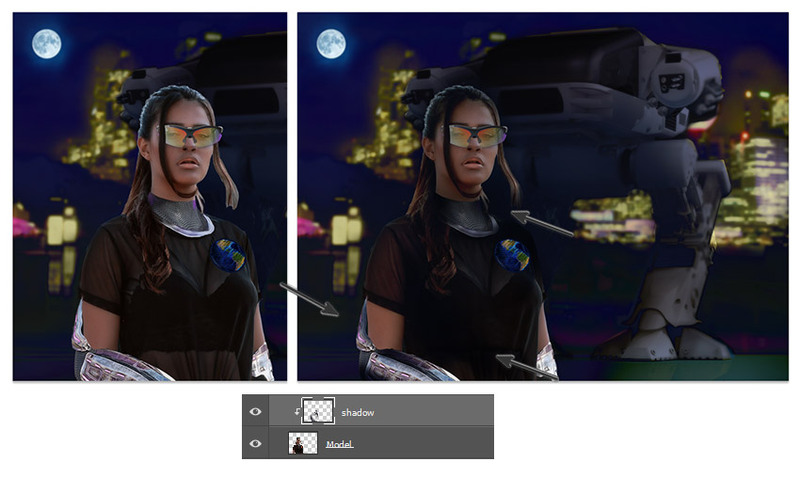 Make sure the highlights reflect both the moon and city as potential light sources. That’s it! Check out the final result below! 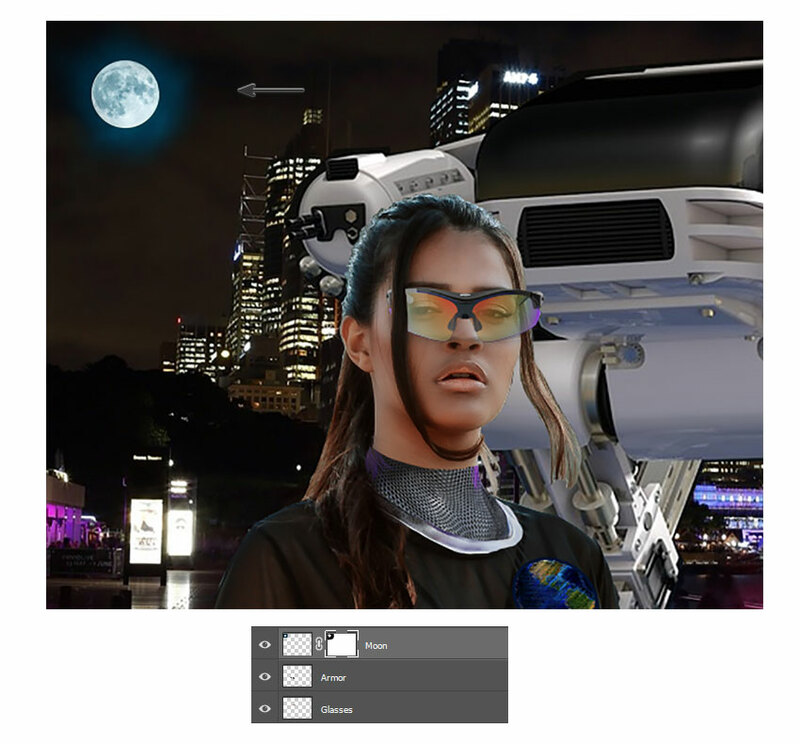 Have fun making your very own sci-fi manipulations by using free stocks and 3D assets. In this tutorial, not only were we able to create an entire scene from scratch, but we also made it look as if it came straight from a movie! I hope you’ve enjoyed this tutorial! How’d you do? Share your comments and results below. CoffeeShop “Nature Metallics” Fine Art Texture/Overlay Set!